Tamahere residents are furious “inaccurate” information about flood risks to their properties has been publicly released with the potential to affect their property values. The Waikato District Council yesterday released a study into the drainage patterns of the Tamahere Country Living Zone, showing potential flood risk areas during “extreme rainfall” for 920 properties. But the move has infuriated some residents, who say the data is dated and doesn’t take in to account extensive drainage work undertaken in the area. The Waikato District Council has released out-dated information about the likelihood of some Tamahere properties to flood at times of heavy rainfall over the objections of local representatives. Aerial maps used in a study to show properties that may have a build-up of surface water in a one-in-100 year storm date from around four years ago (2007-2008). Both the Tamahere district councillor Wally Hayes and the Tamahere Community Committee had urged the council to release up-to-date information, expected to be available later this year. Investigations are continuing on plans for a Tamahere village hub following feedback at last month’s public open day. Community views on the two hub design options are divided. Nearly half (29) of the 62 responses favoured Option A – retail development located on the corner of Devine Road and the proposed link road. Sixteen responses supported Option B – retail development located central to the proposed link road and recreational area – but a further 17 responses were unsure about either option. 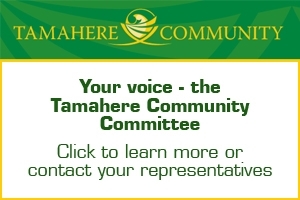 Tamahere people are being asked for their views on significant changes for Tamahere, including the site for a proposed village hub or retail centre, and on far-reaching changes to local roads. The Waikato District Council held a well-attended open day in the Tamahere Community Centre this week to gauge views on two options for a hub and on a number of proposed roading changes, which could significantly impact on the way locals use and travel around the area. The deadline for feedback, on the form available on Tamahere Forum, is Friday, February 18. The Waikato District Council will seek more views about recreational facilities and a commercial hub for Tamahere at a public open day on Thursday, February 10. 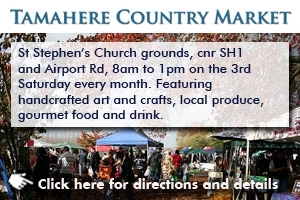 Last July, the council asked for comments on how the community wanted to see the Tamahere Country Living Zone develop. Since then, the council has reviewed the feedback, made additional investigations and is now seeking further comment,” said Waikato District Council General Manager Strategy & Support Tony Whittaker. Tamahere residents are being asked for their views on how Tamahere will grow and develop in the future in a critical review of the area by the Waikato District Council. Tamahere residents have a chance to give their views on how Tamahere develops – to have a say on everything from walkways, cycleways and commercial development to roads, reserves and recreational areas.